Acrylic on Canvas Surreal Painting from Peru in Blues, "Blue Dream"
Crashing surf reaches skyward in a composition in blues. Seen in profile, a serene man seems to dream behind closed eyes. 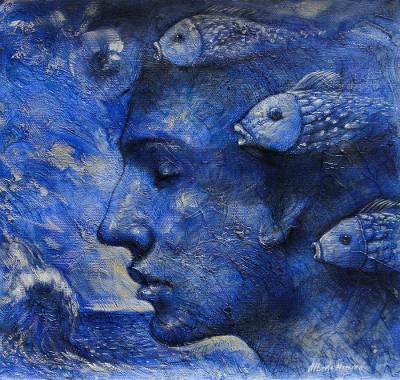 Fish drift past him as though they are thoughts in this compelling surreal canvas by Peru's Alberto Herrera. Titled "Sueño azul" in Spanish.